It’s been a little over one month since I became a Race Pace Runner working with Jess. How’s it going? I love it. Don’t I look happy? This is from my freshmen yearbook. 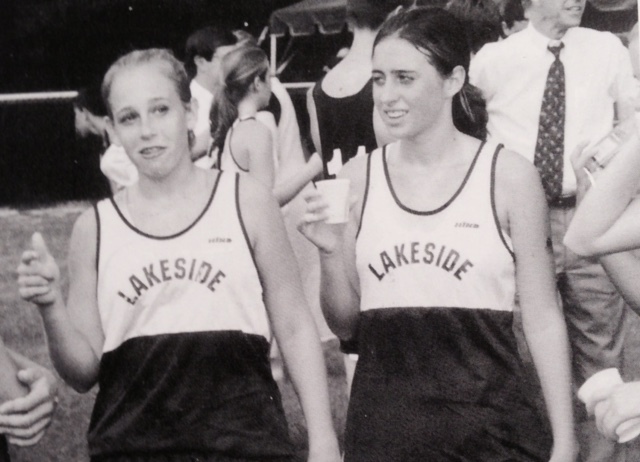 The caption reads, “Kristin and Anne are satisfied with their strong run.” HAHA. So why now? I’m really grateful that my job allows me to maintain a healthy fitness level. I love being so in tune with the downtown fitness community and checking out new fitness studios as they pop up. While I was opening our new store this winter I was doing 3-5 different/new workouts every week. It was fun and challenging, and I loved testing myself in different skills with different muscle groups. Once the store opened I didn’t have as much time to venture from studio to studio, and I was really missing running. I enrolled myself in 9+1 with the NYRR for the 2016 Marathon, and I found myself hating the short races. I would do them. I’d finish in an ok time. After a couple races I realized I could do better. I needed a push from someone other than myself. Why I love being a Race Pace Runner- Jess sets my weekly workout schedule so I don’t have to think about it (THANK YOU!) and checks in weekly to hear how training is going. She asks questions and calls me out when I’m not being direct enough with what I want. Much like my team at work she is a stand for my balance too. She’s encouraging and realistic. She doesn’t set goals that are unattainable, but she also doesn’t go easy on me. The results- 2 PRs!! Yes this is very exciting and I’m very happy, and I know this won’t always be the case. Eventually I’ll have a race that doesn’t go my way, and I’ll talk it out with Jess, set new goals, and go from there. The results I really love are that I’m training smarter. I feel stronger! I’ve been doing Pilates (I LOVE it, especially at Karen Lord Pilates) and one other strength training workout each week, along with some other core training, and I can feel it! Things as simple as holding a plank are getting easier (they’ll never be easy). I’m stretching more and running more on feel than pace, and really listening to my body. My hope is that when I start training for longer races I won’t get hurt. I’m foam rolling like crazy and it’s amazing how much that helps. I have three races over the next three weeks. I’m so excited for all of them! Now that I’m really racing them I get butterflies in my stomach like I do before halfs and marathons! I’ll be celebrating that I’ve completed 9+1 by mid-June, and capping off the month by watching and cheering for my family as they run the Peachtree Road Race. I love running! **Update- I ran the Oakley Women’s 10k this past Saturday- 54:41! Now I’ve run three PRs! The GPS couldn’t catch on my watch so I really did this based on effort level. Coincidentally before I went to bed the night before, I read this article on not being too attached to my watch, so I didn’t stress too much. Plus, this is how Jess coaches me- by effort level not watch pace, and it sure was helpful today!! Thanks Jess! Aw! You’re the best! Thank you for working hard and for asking me to be your coach!